Construction is about to commence in Algiers on the third largest mosque in the world, which will only be smaller than the pilgrimage sites of Mecca and Medina. German firm KSP Jürgen Engel Architekten won a competition to design the Mosquée d’Algérie back in 2008. 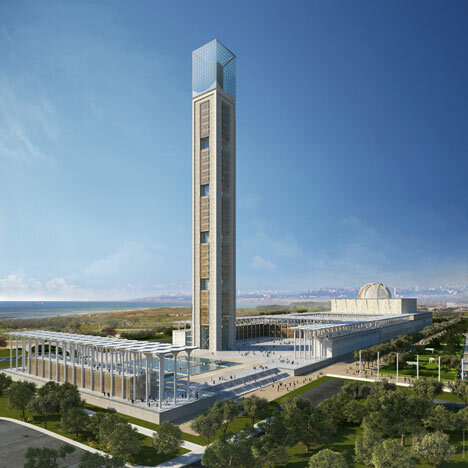 At the centre of the proposals is a 265 metre-high minaret, which will contain lifts to an elevated museum and research centre at its pinnacle. A prayer hall at the far end of the site will accommodate up to 37,000 worshippers beneath a 50 metre-wide domed ceiling. The complex will also include a cultural centre, a Muslim school, a library, a fire station and apartments, surrounding a central square. The entire project is scheduled for completion in 2016. KSP Jürgen Engel Architekten completed an art museum in China last year, which we published on Dezeen - see the project here. See also: more stories about mosques, including a twisted mosque by BIG. As part of the celebrations of Algeria’s National holiday on November 1st the foundation stone for the new “Mosquée d’Algérie” was laid at an official cere-mony in Algiers. This formal act marks the beginning of the construction of the world’s third largest mosque after the Islamic pilgrimage sites in Mecca and Medina. With its prayer hall for up to 37,000 people and the approx. 265-meter high minaret, the Mosque will in future be one of the largest religious buildings in the Islamic world. The complex offers space for up to 120,000 visitors daily and, in addition to the prayer hall and the minaret, boasts further facilities such as a cultural center, an Imam School, a library, apartments, a fire station, a museum, and a research center. Located a mere six kilometers east of the historical town center and not far from the airport, the new mosque com-plex, which has a gross surface area of approx. 400,000 square meters, is an important stimulus for the future development of adjacent districts. The new focal point combines religion, culture and research, while at the same time serving as a new center for the surrounding quarters. Construction of the complex is due to commence in early 2012, once the requisite preparatory measures have been concluded. Commissioning is planned for 2016. The entire complex is being built on behalf of the Algerian government on the basis of plans drawn up by a consortium consisting of KSP Jürgen Engel Architekten and the engineering firm Krebs und Kiefer International in Darmstadt, Germany. In 2008 the design submitted by the consortium from Germany won the international competition, and the ceremony for the signing of the contract for the planning services was held in July 2008 in Algiers in the presence of the German Chancellor Angela Merkel.